Wilder: I'll Fight Whyte - If Contract Guarantees Joshua is Next! WBC heavyweight champion Deontay Wilder (38-0, 37 KOs) is willing to fight Dillian Whyte - if promoter Eddie Hearn can guarantee, in a binding contract, that IBF, IBO, WBA world champion Anthony Joshua would be the very next opponent. Joshua returns this Saturday night, when he defends his belts against late replacement Carlos Takam at Principality in Cardiff. Whyte will see action on the undercard, against Robert Helenius. Wilder has a mandatory defense scheduled against Bermane Stiverne on November 4 at Barclays Center in Brooklyn. But for the last few weeks, Hearn has not been offering up Joshua for a Wilder unification. Instead, Hearn has been pushing for a February showdown between Wilder and Whyte at the O2 Arena in London. Hearn has made an offer to Wilder of $3 million plus the American TV revenue. 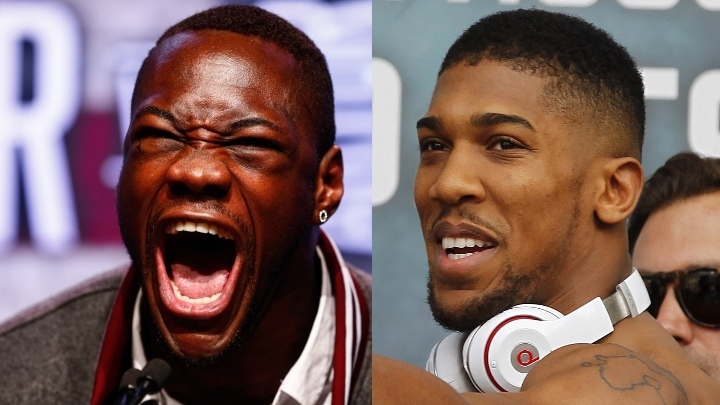 Wilder would be open to doing the fight - if Hearn guarantees Joshua is next. "Fighters have obligations to fulfil, they have a job to do, and Dillian Whyte is only doing his job. He is doing what he is supposed to do and, if he is feeling that way, let's see him. Personally, I don't think he feels that way. He knows he can't beat me, [promoter] Eddie Hearn knows he can't beat me," Wilder told Sky Sports. "If they want to see that fight, I have no problems fighting that fight, as long as that contract says I have Anthony Joshua next. I will go anywhere in the world to show Dillian Whyte who is the best in the world. Put Anthony Joshua on that contract and I will come to England. Dillian Whyte is an easy fight, I can fight that fight in my sleep, one hand behind my back. "I am the heavyweight champion of the world, I want to unify the heavyweight division and I won't stop until I do that. If Eddie Hearn wants me to fight Dillian Whyte, I have no problem smashing Dillian Whyte but make sure, when you have that contract, you add Anthony Joshua, because I am going to come and knock down that kingdom that I helped build up." [QUOTE=Vinnykin;18165920]Was it a binding contract and had rough splits been decided before? I need the details of that case. [/QUOTE] You need too much. Do some research b4 you start bumping your gums about things you know nothing about. Well said Champ, let’s see if Eddie Hearn puts his money where his mouth is. I hope Eddie doesn’t comes back with an excuse on why not making this fight happen after this interview. Let’s see his excuse now!!! !